I made this cake for Project Pastry Queen, but it was not the chosen recipe. Well, the cake itself, buttermilk cake, was. But it's supposed to have Jack Daniels buttercream. A silky, Italian meringue buttercream spiked with whiskey. And while I do love cooking with it, I don't feel comfortable eating it while I'm pregnant. So using the beverage inspiration, I came up with a pregnant-friendly alternative - Arnold Palmer cake! For those of you who are unfamiliar with the drink, it is just sweet tea + lemonade. I did follow the recipe for the buttermilk cake, and it was a wonderful white cake. Prior to this, I actually have yet to find a white or yellow cake recipe that I love, so I am excited to have this recipe in my repertoire now. And going with the beverage-spiked icing, I made a swiss meringue buttercream spiked with sweet tea. I reduced some tea down to a syrup, added that to my buttercream, then added some more tea to amp up the flavor. It is still a subtle flavor, but it does intensify the longer it sits. I reduced 1 cup of tea down to 2 tablespoons of syrup, but I think next time I would start with 2 cups and reduce to 1/4 cup. And for the lemonade component, I used a lemon cream filling: whipped cream + lemon curd. The resulting cake was really fantastic. A soft and light buttermilk cake, sweet-tart filling, and buttery and sweet frosting. I absolutely loved this cake, and since the flavors are subtle, it makes for a really light and summery dessert. Thanks to Beth of The Powdered Plum for choosing the cake; my apologies for taking so many creative liberties! I really do want to try the Jack Daniels Buttercream, so I know it will be on my short-list once I have the baby. I'm thinking it would go really well with a chocolate cake! Beth has the recipe posted, and check out Project Pastry Queen to see how the other members liked the cake. Bring the tea to a boil in a medium saucepan set over medium heat. Cook until reduced to about 1/4 cup. Remove from heat and cool to room temperature. Combine the egg whites, sugar, and salt in the bowl of a stand mixer set over a small pan of simmering water. Whisk constantly by hand until the sugar has dissolved and reaches 160 degrees. (the mixture should feel completely smooth when rubbed between your fingertips). Attach the bowl to the stand mixer and fit with the whisk attachment. Starting on low speed and gradually increasing to medium-high speed, mix until still (but not dry) peaks form. Continue mixing until until the mixture is light, fluffy, glossy, and completely cool (test by touching the bottom of the mixing bowl), about 10 minutes. With the mixer on medium-low speed, add the butter 2 tablespoons at a time, mixing well between each addition. Scrape down the sides of the bowl, increase the speed to medium, and mix until the buttercream comes together (it can take up to several minutes, but it will come together eventually). Switch to the paddle attachement and beat at medium-low speed to remove air bubbles, about 2 minutes. Add the syrup, and mix to combine. Taste and add more sweet tea if desired. Whip the cream at high speed until soft peaks form. Gently fold in the lemon curd. Your cake looks beautiful and perfect for spring or summer. The lemon cream filling sounds especially good! What a clever alternative! I love this idea. I am not really a whiskey fan, I think this sounds and looks absolutely lovely. I couldn't wait to hear how your cake turned out. Excellent execution! I use the white cake from that recipe all the time, for many different kinds of cakes. It is the best white cake!! 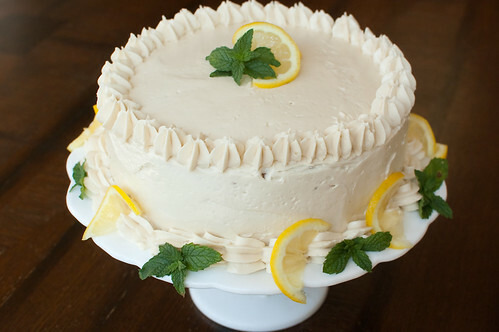 This cake is plain and simply pretty. Love it! I wish I had seen this recipe last week! Arnold Palmer's are my husbands favorite and his birthday was last week. I am going to have to make him this cake sometime soon. You've decorated it beautifully as well! It's beautiful, Josie! And, being a fan of the Arnold Palmer drink, I'm sure I'd be a fan of this as well. I don't even think I would try the Jack Daniels version over this! 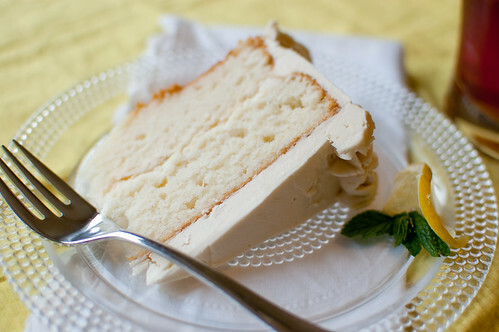 You had me at sweet tea buttercream. Its looks great. You've decorated it beautifully! This looks so good! The color is beautiful. It makes my mouth water! Whoa! What an awesome cake! Looks great. Yum! I’ve never made cake before, this makes me want to try it. This looks absolutely perfect. Thanks for such a great post, I am totally impressed! Keep stuff like this coming. Comfortably, the post is really the sweetest on this precious blog. I am very thank you to share this cake ,it’s very good, I hope you can share more like this, thanks!